If you have a garage then you know the forever feeling of, “Did I remember to close the garage door.” Did you know that a surprising 30% of burglars break into a home through an unlocked door or window, without force? We at Garage Door Rescue believe we have the answer for you. Smart garage doors allow you to control your garage door from the comfort of your car, home or even out and about, it’s as easy as changing the channel on the TV. If you would like more information on our smart garage doors. Contact us today! What Are Smart Garage Doors? I’m sure that you have all heard of closing your garage door manually, that’s normal right? Not anymore. A smart garage door brings this to a whole new level of smart technology to your home as smart garage doors can be open and closed through a smart app on your phone. Having a smart garage door gives you the ability to save vast amounts of time and also saves you the inconvenience of getting in and out of your car every time you wish to enter or leave your garage. A smart garage door will save you time and allow you to open and close your garage door with ease even if you are late or worrying about being somewhere on time. Scheduling – Work your garage door around you and your daily routine. You can pick and choose when your garage door opens and closes for your convenience. Geolocation – Geolocation is a feature that allows your garage to track where you are on your route home. This allows your garage door to open when you arrive home instead of you waiting on the drive on arrival. Voice Control – You can actually say commands to your garage door out loud in which your garage door will respond. Remote Control Access – You are able to control your garage door via an application on your phone. This allows you to control your garage door from any location. Security – Depending on the security system you have, your system could be linked to your garage door. If your garage door is opened whilst the security system is armed the alarm will sound. The garage door smart app will allow you to control your garage doors from where ever you are. These apps are usually available to download from your smartphone. This app can bring you 100% comfort as you will have 24/7 access to your garage door and your home. How Do Smart Garage Doors Work? Surprisingly, the answer is simple! Garage Door Rescue would attach a sensor to your existing garage door, the sensor will then detect the state of your garage door (open or closed) and send this information to your app. 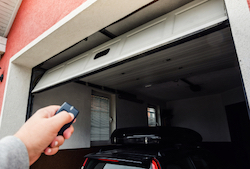 What Are The Benefits Of A Smart Garage Door? Smart Garage Doors allow better security for your home. You may not realise it but your garage door is the largest entrance into your family home. This means it should be secure at all times to protect your family and your possessions. This makes having the extra reassurance of a smart garage door and 24/7 access to your garage a great security barrier to intruders. Accessing your garage door through a remote control also allows a lot more control and freedom whilst out and about. If you are running late for school or are dropping the kids off at school and forget to close the garage door, just tap your app and in an instant, it will be closed. The ability to connect your garage door to your security system will also bring your family safety. If the garage door is opened whilst the security system is armed the alarm will go off alerting you, your family and the authorities. Your garage door can be one of the most vulnerable entrances of your home. Many people forget to lock their garage doors or the door leading from the garage door into your home for convenience purposes. Unfortunately, this does allow it to be convenient for burglars as well. Your garage door is one of the most appealing rooms for a burglar as some of your most expensive possessions are usually held in the garage, meaning garage door security is imperative. A smart garage door allows you to know when your garage door is open and closed, you also have the ability to close it whenever you want. This provides you with a sense of security and makes it a lot harder for people to just walk in and out of your home. Garage Door Rescue has been installing and repairing all kinds of garage doors for over 20 years. Garage Door Rescue is a family run business and has talented, qualified and experienced engineers who can help you to install or repair your garage door until you are completely satisfied. We like to make sure that our loyal and valued customers receive the service they deserve. We will answer any questions you have and then give you a fixed quote for the service. We at Garage Door Rescue would be happy to answer any question you have, to speak to an engineer today please call 01793 393503 today!